The VapourJET Multi Pro-500 is an up-right garment steamer with five power settings made for retail shops, work-rooms, designers, hotels & businesses that make, handle, display or sell clothes and fabric goods etc. It is used when you have hanging garments or textiles which are wrinkled and need to be touched up fast. It produces a strong, continuous flow of warm, moist steam, which helps to release wrinkles in fabric fibres. If you have a clothes shop, for example, and your garments are transported or handled; then they will soon start to look crumpled and creased, so switch on the VapourJET Multi Pro-500 and have them looking presentable again. It can be much faster than standard ironing and is very simple to operate. Whether its finished garments, clothes, bridal wear, curtains or textiles etc. 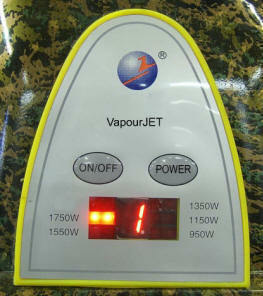 : the VapourJET is an easy way to steam. Variable Power button allows the operator to select 1 of 5 different power setting. This will increase or decrease the steam production to suit a particular job and is useful where many different types of textiles & fabrics need to be steamed. Its Rapid Steam feature, has it steaming in around 60 seconds from cold, so there's no waiting around before you can use it. The VapourJET Multi Pro-500 has a large 5.5 litre water capacity and a removable water tank so you can fill it straight from the tap. Durable enclosed body, mounted on castors. Rapid Steam quick start-up time of around 60 seconds from cold - so you can start working almost straight away with little or no delay. Variable Power - With 5 power setting. Powerful 1750W heating element Removable cold water tank - for easy filling and topping-up straight from the tap. Metal heat exchanger/chamber with enclosed element - for improved durability. Light weight steaming handle - to help reduce operator fatigue. 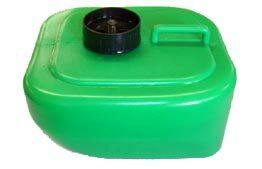 Auto filling - takes water from the cold tank as necessary. Out of water warning - both LED light & buzzer fitted. Long steam hose - with protective nylon outer cover. Built-in height adjustable Hose Stand - so you can set a comfortable work height and it also splits into sections - making the steamer portable and easy to move from site to site. *In hard water areas it is recommended to use softened or treated water.